Eric Hill was first drawn to the guitar at an early age after hearing the playing of Django Reinhardt. At first he played jazz in semi-professional bands in the West London area . At this time he was studying the classical guitar with Geoff Sisley and later the jazz electric guitar with Ivor Mairants. At Leeds University, from where he graduated with a Science degree, Eric was a prizewinning soloist in the Inter University jazz competitions and also accompanied visiting stars such as the legendary Joe Harriot. His main musical influence at this time was Stan Getz’s guitarist Jimmy Raney. 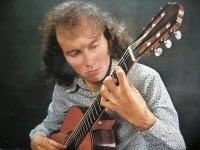 On hearing Julian Bream at a Wigmore Hall concert, Eric resolved to concentrate on the classical guitar and to devote himself full time to the instrument, after sensibly finishing his graduate studies! Shortly afterwards, Eric studied with Julian Bream and found this to be a seminal experience. Eric was a prizewinner at the ORTF “Concours Internationale De Guitare” in Paris and has presented recitals all over the world including the Wigmore Hall, London and the Lincoln Centre, New York. He has recorded several highly acclaimed albums of classical repertoire and made many broadcasts for the BBC. Having achieved what he set out to do in music, and after 25 years as a professional guitarist, Eric returned to his other interest, Science. A PGCE at Kings College, London equipped him to enter Science Education as a Physics teacher. Being part of a school community provided a great contrast between the relative isolation of the virtuoso guitarist and the highly interactive teamwork of school life. After 12 happy years and having survived a serious illness, Eric took early retirement and returned to guitar playing and teaching. In this “born again” state Eric now concentrates on fusing classical guitar techniques with jazz improvisation on the solo nylon strung guitar. 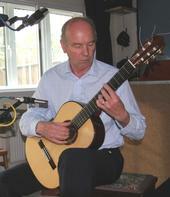 Eric is a guitar tutor at Bedford School, directs the North Bucks Guitar Ensemble, and plays in duos with both flautist Jill Hughes and guitarist John Zaradin. He is also a member of the De Parys Trio.